It’s Saturday, July 28, 2018, and soon August will be upon us. It’s National Milk Chocolate Day and World Hepatitis Day, which have no connection. 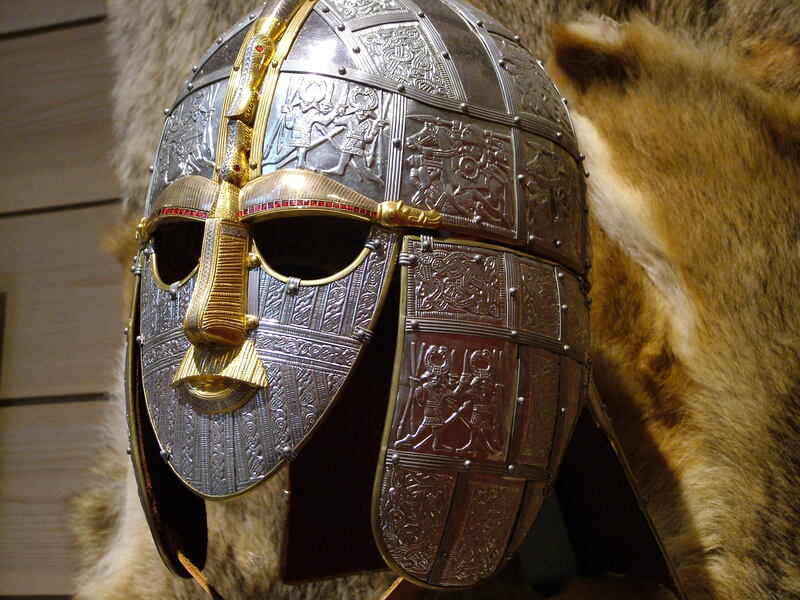 The Sutton Hoo helmet is a decorated Anglo-Saxon helmet which was discovered during the 1939 excavation of the Sutton Hoo ship burial. It was buried around 625 and is widely believed to have been the helmet of King Rædwald of East Anglia, and its elaborate decoration may have given it a secondary function akin to a crown. 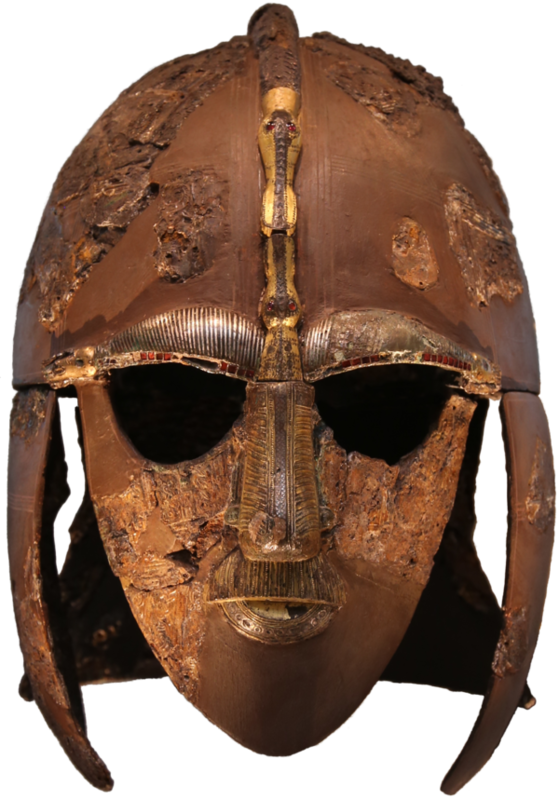 The helmet is “the most iconic object” from “one of the most spectacular archaeological discoveries ever made,” and one of the most important Anglo-Saxon artefacts ever found. Its visage features eyebrows, nose, and moustache, creating the image of a man joined by a dragon’s head to become a soaring dragon with outstretched wings. It has become a symbol of the Dark Ages and also “of Archaeology in general.” It was excavated as hundreds of rusted fragments, and was first displayed following an initial reconstruction in 1945–46, and then in its present form after a second reconstruction in 1970–71. On July 28, 1973, the Summer Jam celebration took place at Watkins Glen, with a rock festival crowd of around 600,000. Yours truly was there with a pal, and I’m told it was the biggest rock festival in history. Finally, on this day in 2005, the Provisional IRA ended its 30-year armed campaign in Northern Ireland. Notables born on this day include Gerard Manley Hopkins (1844), Beatrix Potter (1866), Marchel Duchamp (1887), Rudy Valée (1901), Malcolm Lowry (1909), Mike Bloomfield and Bill Bradley (both 1943) and Hugo Chavéz (1954). Those who died on July 28 include Antonio Vivaldi (1741), Johann Sebastian Bach (1750), Marie Dressler (1934), Roger Tory Peterson (1996), Francis Crick (2004), and Eileen Brennan (2013). Heres Brennan playing Genevieve the waitress in my favorite American movie, The Last Picture Show; also appearing in this scene are Ben Johnson, Timothy Bottoms, and Jeff Bridges. 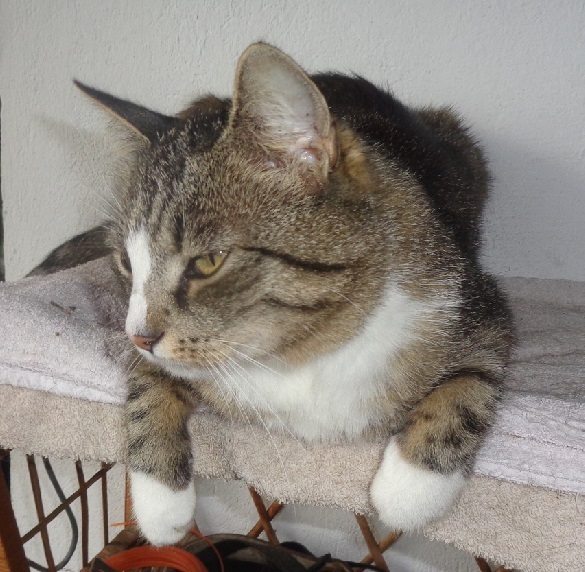 Meanwhile in Dobrzyn, Hili seeks pleasure—but where? Hili: Where to look for happiness? Hili: In the kitchen or in the garden? Hili: W kuchni czy w ogrodzie? Look at this baby giraffe struggling to stand up only a few minutes after birth. With lions about, it better! Note the absence of women, which wouldn’t occur were this picture taken today. See how many evolutionists you can recognize. I’ll name one: my academic grandfather Theodosius Dobzhansky, fourth from left in the top row. It’s been bloody hot and dry in Britain; look at these pictures! Gli, the Hagia Sofia cat whom I’ve visited AND fed (see last part of my post here). Baby cat drinking milk. Look at the ears! 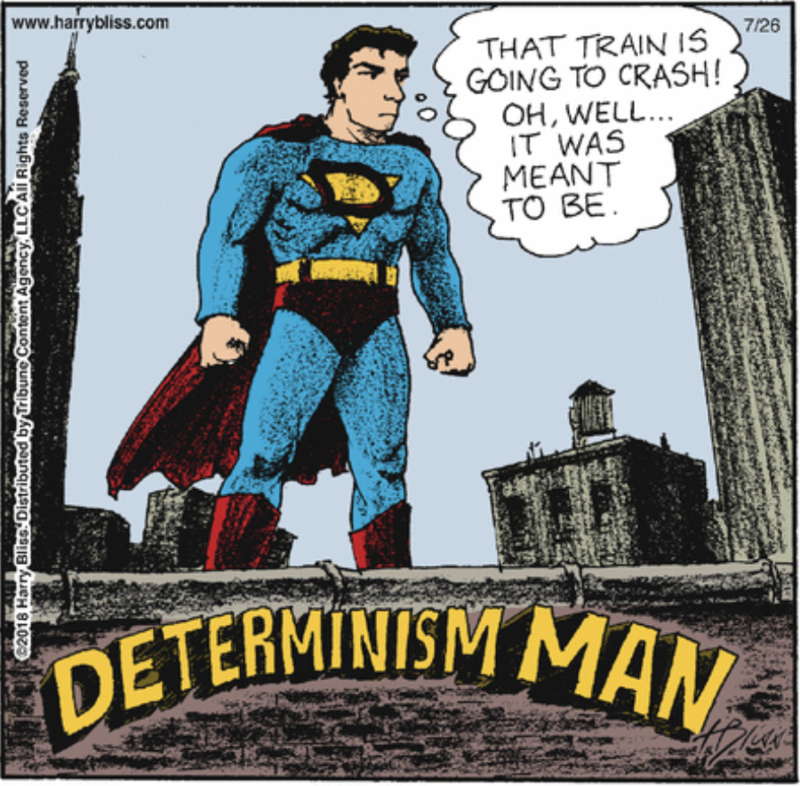 And “Determinism Man,” a panel from the comic strip Bliss submitted by several readers. It commits the fallacy of asserting that intervention is useless if determinism be true. This entry was written by whyevolutionistrue and posted on July 28, 2018 at 6:30 am and filed under Hili Dialogue. Bookmark the permalink. Follow any comments here with the RSS feed for this post. Both comments and trackbacks are currently closed. Is “bunch” the proper group-term for evolutionary biologists? (How about a “clade?”) Let the evolutionary biologists decide. I guess you are correct, the Watkins Glenn event was the largest as it was a one day event. Three years earlier the Isle of Wight estimated 600,000, possibly 700,000 but that was three days. No, George, we dutifully had tickets. But by the time we got there, it was pandemonium and the fences were down. Great music, though. Jerry Garcia or Jerry Coyne? Apparently, the answer is “yes”. Milwaukee Summerfest (which is primarily Rock music) regularly exceeds these numbers. Last year attendance was 831,769. However, that is over the span of ten days. The skill of “dark age” Silver and Goldsmiths ,never cease to amaze me. Im with you there. There has been stuff shown over here on BBC TV that leaves you gasping. Determinism Man had no choice but to let the train crash. I think he might be more aptly named “Fatalism Man” — not that he had any choice in being a fatalist. He couldn’t do anything other than what he actually did, which is where determinism is congruent with fatalism. That reminds me of Denis Diderot’s superb 18th century novel “Jacques the Fatalist”—I’d be curious to hear what PCC thinks of that work. Mostly a matter of a poor upbringing. At least he is as effective as the thoughts and prayers people. And I thought my cat was doing pretty good when he created a new Word document and named it “+”. The LA Times had an article about the donkeys painted as zebras. It mentioned that they regularly paint burros as zebras in Tijuana, Mexico for tourist picture-taking. However, the tourists are in on the joke. Sutton Hoo looks like he was wearing Ray-Bans. Very cool!